Colorful, delightful, and cute describes this adorable new game from Twister Display. Gone Fishin' appeals to young and old as they try to catch the Puffer Fish resting in the canvas. Each fish has a screw is it's the nose and the magnet on the end of the pole picks the fish up fast. This 7'x7' game is colorful, compact, cute, and sets up in minutes. 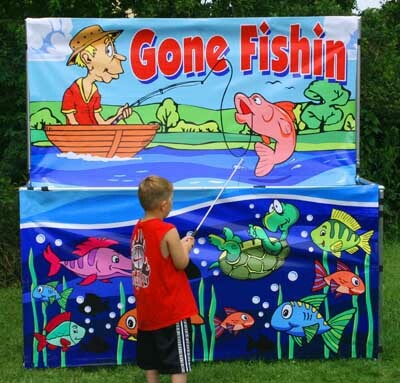 Each Gone Fishin' game comes with 12 colorful Puffer Fish and a 4' Aluminum Fishing pole! Size: Height: 7ft. Width: 7ft. Depth: 3ft.